The kind people from Book Publishing Company sent me a copy of their latest vegan cookbook to review. It’s got a very upmarket feel to it compared to some of their earlier books; they’ve obviously spent a lot of money on the printing and cover. 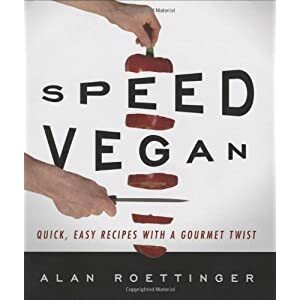 Alan Roettinger is a private chef and I’d never heard of him before the book plopped on to the door mat. The book aims to produce more exotic dishes than the usual quick or speedy cookbooks with some unusul flavour combinations and ideas. The chapters include a section on jump starts – flavoured oils and sauces that you can make in bulk and have ready for speed. Then there’s snacks, soups, salads, pasta and grains, vegetables and legumes and sweets. I picked 3 dishes to try so that I could get a feel for how the author writes and how his flavours work. First was the Black Beans, Mushrooms and Bok Choy. It had some intriguing flavours and as well as the ingredients in the title included red curry paste, sake, balsamic and lime. I decided to serve it with some udon noodles. It was certainly speedy and very very tasty indeed. The lime made it sing! Next was another mushroom dish, Chipotle Mushrooms. This was a very simple quick dish, nice and spicy. 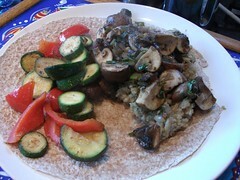 I served it with some griddle vegetables and wholewheat tortilla. They were rich and spicy. The one thing I altered from the recipe is to lower the amount of flax oil. I find the flavour of it a bit dominating and after using just a quarter of the recipe amount it felt as though there was enough oil. If I’d used the suggested amount it would have been puddling round the top. With that alteration it was a very successful side dish. Finally came the asparagus and cannellini. Again this was certainly a speedy dish and used lots of nice fresh spring ingredients. I tossed it through pasta but I think that probably diluted the flavours too much and it would have been better served on its own. All the dishes I tried were certainly speedy. There’s plenty of others I’ve got on my list to try too, including Spicy Black Beans, Mashed Aloo Gobi, Miso and Garlic Mashed Potatoes, Zucchini and Red Beans and Blazing Pinto Beans. I’ve got 2 issues with this book, though they’re nothing I can’t work around. There is WAY too much oil in most of the recipes for me. I’m no low fat vegan, far from it, but this seems to be oil for the sake of it. Mind you, the author’s first book was about Omega 3, so it’s no surprise he’s a big fan of flax oil in particular. I’ll just cut it down wherever I think it needs cutting. The second issue is that there aren’t any suggestions of what to serve with the dishes. There are very few recipes that you could serve on their own as a meal. They’re mostly side dishes or accompaniments. 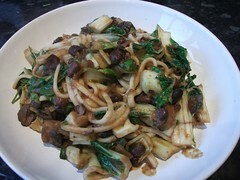 For the first dish, the mushroom and black bean one, the noodles I chose worked perfectly. 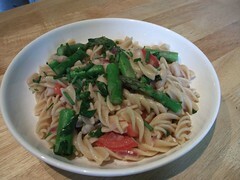 For the asparagus dish the pasta worked less well. So I’d have appreciated some serving suggestions or menu ideas. Other than those, this book is full of nice unusual ideas. The salad chapter is huge. Some people probably think vegans don’t need any more salad recipes, since that’s all we eat anyway, but these are more interesting than lots of salads I’ve seen. All in all this is a good book with interesting ideas and flavours.